In southeastern Pennsylvania, Liberty scientists delivered time-sensitve solutions for emergency pipeline repair challenges. 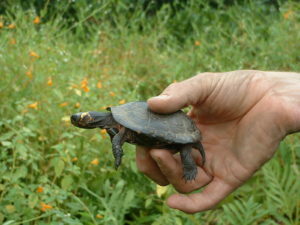 Glyptemys muhlenbergii, commonly known as the bog turtle. Liberty Environmental was retained to perform a Phase I Bog Turtle Habitat Assessment as part of an a pipeline repair project in Bucks County. When the habitat assessment revealed the abiotic and biotic factors known to support the turtle species, Phase II Surveys for the presence of bog turtles were necessary to move forward. Because the project involved an emergency repair, an informal species consultation with the United States Fish and Wildlife Service (USFWS) was held. Due to the time-sensitive nature of the project the USFWS agreed to allow a Phase III Trapping Survey to be conducted concurrently with a Phase II Bog Turtle Survey outside of the April 15 to June 15 bog turtle survey window. Four Phase II Bog Turtle Surveys were performed concurrently with the Phase III Trapping Surveys, which must be conducted for 15 consecutive days. Bog turtles were not observed during the Phase II or Phase III surveys; however, a wetland occupied by bog turtles was linked hydrologically to the subject wetland. Therefore, as per USFWS guidance, Liberty performed a bog turtle pre-construction survey and oversaw the placement of an exclusionary fence around the perimeter of the work area to avoid impacts to the species. Prior to vegetation or earth disturbance, Liberty’s USFWS qualified, recognized bog turtle surveyor provided a Phase II survey of the proposed construction area for the presence of bog turtles. Upon completion of the Phase II survey, the existing vegetation was removed using hand-held gas-powered weed trimmers. Using hand-held rakes, the vegetation was cleared from the work and fence area. A second Phase II survey was then performed within the proposed work area. The bog turtle exclusion fence was placed by digging a narrow trench and installing the fence to a depth of six inches below grade to prevent bog turtles from migrating within the substrate and emerging into the work area. Bog turtles were not observed during the pre-construction surveys or during the exclusionary fence placement, therefore, the client was able to proceed with the pipeline repair.